Nominal Height 71 1/2" High. This unit can be anchored to a wall with available wall anchors, can be placed back-to-back against another High Capacity Wire Wine Display by using the four spacers available with each display. It can also be connected side by side to create an aisle as long as needed. 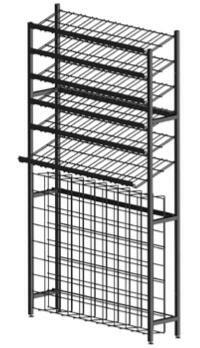 Construted of an all steel tubilar frame with 5 wire upper shelves and a rack in the base.